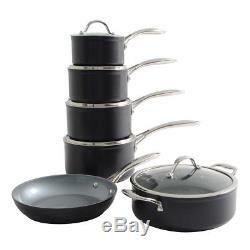 ProCook Professional Ceramic Induction Non-Stick Cookware Set 6 Piece. 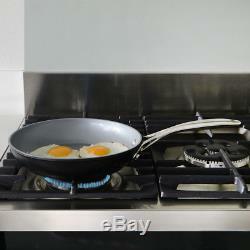 Titanium reinforced ceramic coating, provides a superior non-stick quality, allowing you to cook with less oil. During the manufacturing process, the curing temperature is lower than standard non-stick, using less energy, reducing the enviromental impact on the plant. Constructed from a 5mm heavy duty aluminium disc, with an edge to edge stainless steel base, offering an even heat distribution throughout and a scratch resistant surface. We are proud to say, this range features our CoolTouch® handles on the saucepans, frying pans, wok and saute, designed to stay cool whilst on the hob. Handles are riveted for strength, with the addition of a handy hanging loop at the end for storage. Our Ceramic pans are suitable for; oven use to 260C, all hob types including induction and are dishwasher safe for easy cleaning. Set contains: 14cm/5.5in x 8cm/3in 1.2L 794g, 16cm/6.5in x 9cm/3.5in 1.8L 982g, 18cm/7in x 10cm/4in 2.5L 1178g & 20cm/8in x 11cm/4in 3.5L 1438g saucepans with lids, 24cm/9.5in x 4.5cm/2in Frying pan 816g & 24cm/9.5in x 7.5cm/3in 3.4L Casserole with lid 1697g. 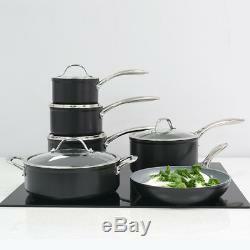 Other items and sets available, search for ProCook Ceramic Cookware for the rest of the range and offers! ProCook design, manufacture & supply innovative products and are passionate about quality and service. This product has a 25yr Guarantee with ProCook. Handles will get hot in oven or on high gas flame. Egg Cups & Breakfast Pieces. Pestle & Mortars & Spice Racks. Egg Rings, Poachers, & Boilers. Splatter Guards & Spoon Rests. Cheese, Cake, & Pizza Servers. All ProCook products have a minimum guarantee period of at least 12 months but many have 10 year or up to 25 year guarantees. Upto 50% off other leading brands. This product has no reviews yet, however see what our buyers say about our other products.. Orders placed before 3pm Monday to Friday will arrive the next day. Orders placed after 3pm on a Friday will be dispatched on Monday to arrive on Tuesday. Channel Islands (ParcelForce 1-2 Day). Our courier does require a signature but in the event that you are not available, they will attempt to deliver your order to a neighbour. Faulty goods during the first 30 days. Faulty goods outside the 30-day period within guarantee period. If during this period you have cause for complaint about the goods you have received then you can return the goods to us, and at our discretion we will repair or replace them. Please refer to individual product pages for details of your guarantee length. Please note the guarantee does not cover deterioration due to accident, misuse, discoloration, scratches, stains or damage from overheating. In the event of the product range being no longer available, we will offer an alternative product of similar quality. Ideally providing a photograph of the fault. In the event of an individual item within a set being faulty, we will replace the specific item, not the entire set. Subject to a valid invoice. View these items & similar. Hear about our latest offers and new arrivals first! The item "ProCook Professional Ceramic Induction Non-Stick Cookware Set 6 Piece" is in sale since Wednesday, June 13, 2018. 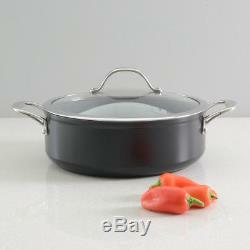 This item is in the category "Home, Furniture & DIY\Cookware, Dining & Bar\Pots & Pans\Pan Sets". The seller is "procookltd" and is located in Gloucester. This item can be shipped to United Kingdom.